September 14th 2006 - Salt! Iodine is stripped away when salt is refined then added back in larger quantity. Kosher salt is not iodized. 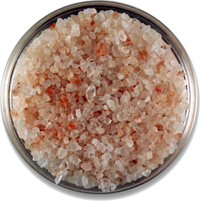 You can also get iodized sea salt which has higher than normal levels of iodine. But we usually don't have a deficiency in iodine from food unless we live inland and only eat local food- how many goiters do you see? Instead iodide is preferentially displaced by chloride (chlorinated water), bromide (white flour) and flouride. So if someone has a low thyroid condition I suggest they get a water filter, use whole grains only and try a different type of toothpaste. Salt doesn't just sit on food, unless the lumps are too large and it doesn't get a chance to dissolve. Smaller pieces melt more easily, like ice does. That is why Ephron doesn't like the big chunks. "Kosher salt gets its name, not because it follows the guidelines for kosher foods as written in the Torah (nearly all salt is kosher, including ordinary table salt), but rather because of its use in making meats kosher, by helping to extract the blood from the meat. Because kosher salt grains are larger than regular table salt grains, when meats are coated in kosher salt the salt does not dissolve readily; the salt remains on the surface of the meat longer, allowing fluids to leach out of the meat"
Everyone doesn't need to avoid salt and in fact some salt is essential which is why our taste is hardwired for it. In fact runners who drink too much don't have enough salt for osmosis and can die of SIADH (see article on SIADH). We need our electrolytes. Only some kinds of high blood pressure are salt sensitive. Avoid it if you get swollen though. I do notice that if I have salted nuts I eat far more than if they are unsalted, so I think salt is somewhat addictive. That even goes for natural salts. has more types of salts than you can imagine. They have a good health section on salt that talks about the sodium hypothesis of hypertension.